Welcome to the one and only Adorablequotes4u.com - Delivering the best quotes and inspirational stories to motivate, Inspire and brighten your day. Worrying is something that only harms your mental health. It is considered a habit that you can learn how to break. Some people believe that worrying serves as a reminder of past experiences and preparation for the future ones. Anyway, it is definitely unhealthy and it only stops your brain from focusing on more important things other than thinking about the future that can’t be predicted or controlled. Worrying is actually thinking about future things that you can’t control and depression focuses on the past events that can’t be changed. Instead of worrying there are other ways you can prepare yourself for the uncertain future that you are afraid of. We are going to explain some methods that you can use to stop your brain from worrying. The technique of writing down the things you are worried about is very efficient. If you can’t fall asleep because you are preoccupied with something, then write it down. This way your brain gets a mental relief and you will have no need to remember the details you already put on paper. For example write down ‘What to serve’? in order to remind you if you are worried about what to serve for the upcoming friend gathering. Also, writing your worries tells your brain that it is actually something important and that the brain should focus on solving the problem and not being worried about remembering what the thing that should be done is. According to researchers people who worry all the time actually have a problem of chronic avoidance. One study published in the journal Anxiety, Stress & Coping involved people who were asked to write three possible outcomes for the situations they worried about. Later, they analyzed their outcomes with practical solutions. Meditation is an excellent method for relaxing your brain and keeping it worry free. Researchers have examined the effects of meditation for reducing cognitive anxiety. Even though you may think you have no time to meditate closing your eyes for 30 seconds right now is a great way to start. You can help yourself and your brain by staying away from the sources of stress whenever you can. Spending just a few moments of your day to relax and avoid being concerned about everything that you are going through can be of great help. Even during meditation the worrisome thoughts may appear, which is perfectly normal. With practice you can completely stop them from intruding your mind. 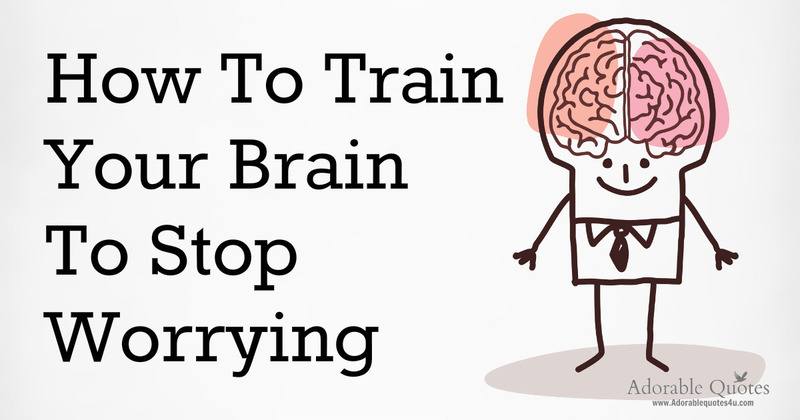 Worrying is a natural response of the brain to protect the body in case of danger. If you are in a life-threatening situation your brain releases adrenaline that gives the same feeling you feel while worrying. Studies have discovered that exercising is an excellent way to reduce the physical symptoms of anxiety such as jitteriness. If the body does not feel the physical symptoms of stress the mind would learn that there are no reasons to worry since the body is not in a state of increased arousal. Exercising also reduces the increased heart rate and breathing that occur while you are worried. By exercising you can also reduce your blood pressure which can also increase due to stress. In case you know exactly what is the reason for your worrying take a walk for about 10 minutes. Try to enjoy the nature and your surroundings and be more aware of your body and each breath you take.